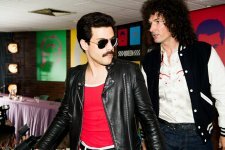 Bohemian Rhapsody release date was Friday, November 2, 2018. This was a Nationwide in theaters release. Friday, January 11, 2019. This was a Expansion release. 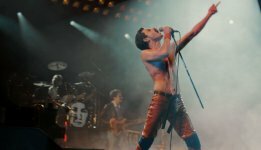 Rights to iconic Queen tunes such as "Another One Bites the Dust," "Bohemian Rhapsody," "We Are the Champions" and "We Will Rock You," have been secured for the film. 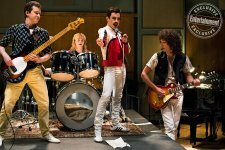 Sony Pictues has the right to opt into the project after the studio reads Anthony McCarten’s script (Deadline, 11/18/15). Fox and New Regency are known behind the project, which will be produced by Graham King (Hollywood Reporter, 11/4/2016). 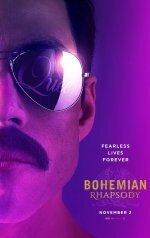 Twentieth Century Fox, New Regency and GK Films will expand Bohemian Rhapsody, Golden Globe winner for Best Picture (Drama), starring Rami Malek, Golden Globe winner for Best Actor (Drama), to more than 1300 theaters in the U.S. and Canada this Friday, January 11. 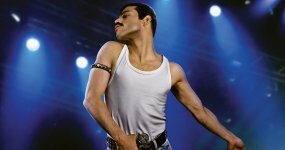 More than 750 of the locations will be playing a never before experienced "sing-along" version of the foot-stomping celebration of Queen, their music and their extraordinary lead singer Freddie Mercury (1/10/2019).